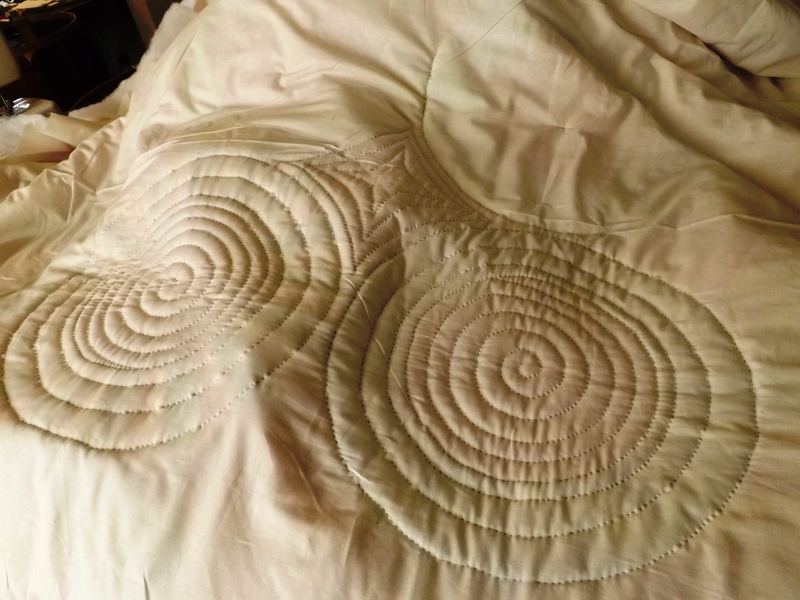 I am not being fussy about the quilting…..I feel like this is better suited to a less formal treatment. I am not marking anything, just quilting. and simple outlining in the setting pieces. Since I think the fabrics are from the 60’s and 70’s I felt like the batting would have been poly…so that is what I am using. 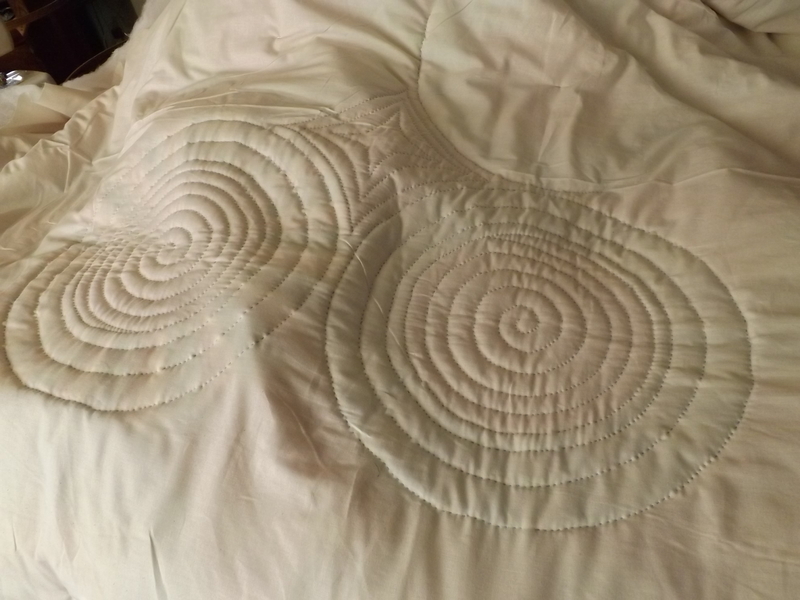 It is a rather simple quilting design so this one should go relatively fast. More pictures soon….and maybe a video of big stitches. 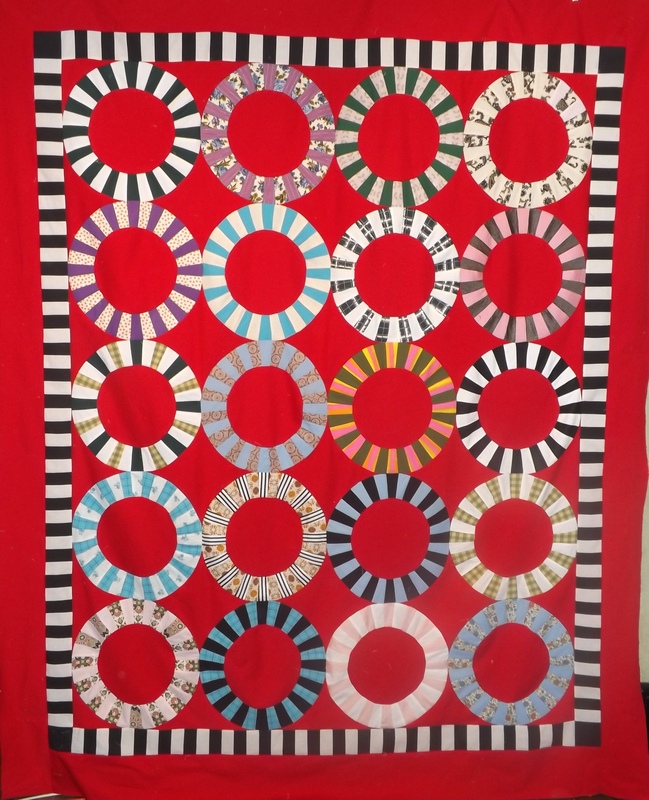 This entry was posted in Quilts and tagged big stitch quilting, hand quilting, Quilts, single wedding ring. Those circular stitches look great in the centers! Nice quick and effective! Ok, now that the song was out of my mind, it’s back for the day! 🙂 Old Mother Carter sure could play! Beautiful!! Definitely plan to make this one too. What are you quilting this one in? a hoop, floor frame? 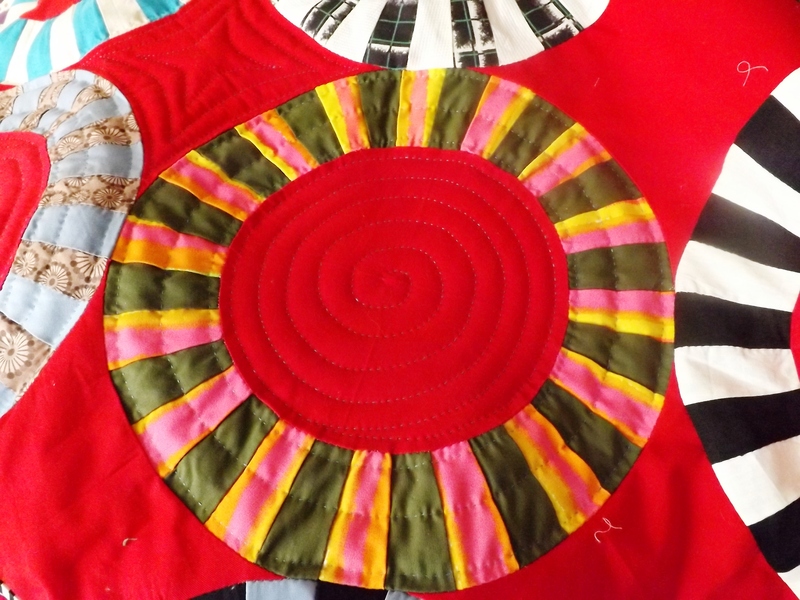 I have it in the hoop stand right now….it is easy for me to switch back and forth between quilts in that stand..the hand held hoop is good for that too, but the one on the stand keeps the quilt off of my lap and it is getting a bit warm to have a quilt in my lap! It is very striking! Such bright red and dynamic rings. Love the border too. I enjoy reading about your process and look forward to more. 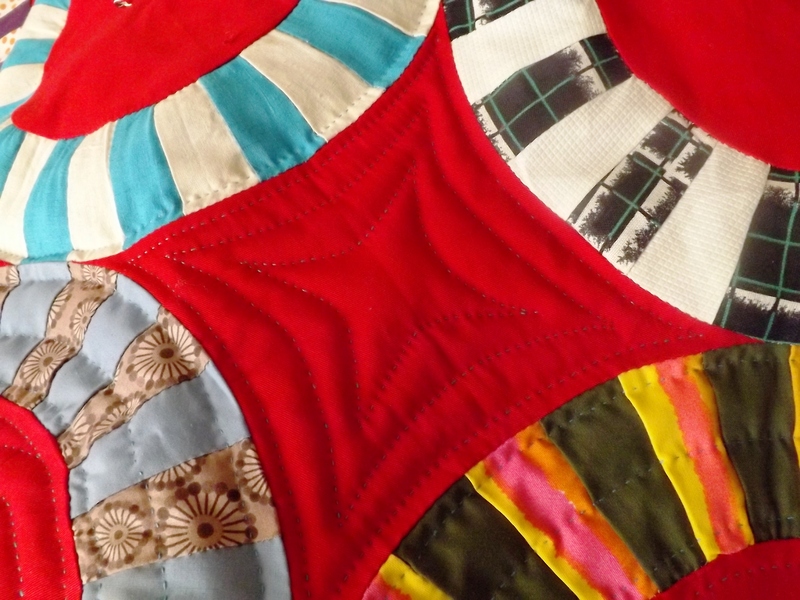 Oh yes….your quilting choices are excellent for this top!! Round and round she goes……….. This is going to be fabulous! 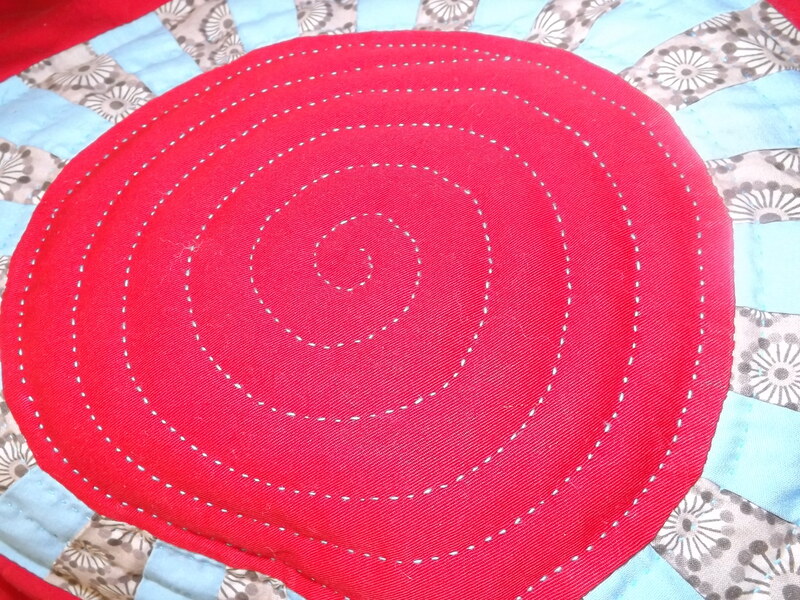 Love your swirl quilting. :) I’m always so amazed at how you’re able to go back and forth from your very formal quilting to improv. quilting. Very inspirational! This is great! It makes me dizzy! A video of big stitching would be perfect as I want to have a go myself. 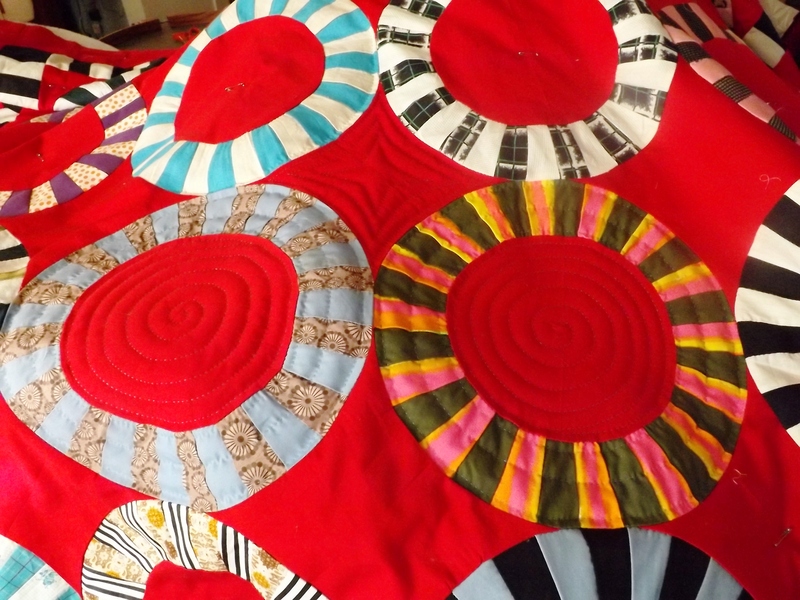 I’ve been practising free stitching and I love it as over-all wonkyness can look amazing I think, (well, that’s my excuse…) But you would think you had marked those circles, your free quilting is so neat – I enjoy looking at your quilting so much so thanks again for so many pictures. I love it! Red is also one of my favorite colors. Thanks for sharing. Hard to not be happy with a red quilt! Your quilt is beautiful and the video is great! Of course, I could listen to Johnny Cash sing anything! I listen to him all day when I am quilting or machine sewing. Thanks for sharing Tim.